On nights where I can’t be bothered to cook, I begin to really miss college. Back then, I was young, impressionable, and a budding future food-fanatic, thanks to the many competing restaurants and extreme cultural diversity in the area. 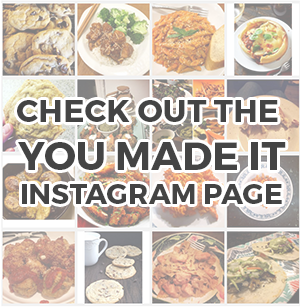 There was cuisine from nearly every country– from Lebanon to Italy to Ethiopia– and despite being the epitome of a broke college student, I tried them all. And even though I’ll admit that some of the “foreign food” wasn’t 100% authentic, it really did feel like I could sample the world’s flavors without ever having to set foot inside a plane, train, or automobile. (I had no car. Reference “broke college student” above. Luckily, all of these places were within walking distance of my apartment.) Out of all the things I tasted, all of the places I journeyed to by way of taste buds, it was Thai food that was by far my favorite. I can’t say there are no Thai places in my area now that I’ve moved away, but none as close to my home (and as close to authentic Thai food) as they were when I was still in New Brunswick. Instead, now, lazy days are usually reserved for freezer meals or leftovers (we don’t judge here, remember?) and my more ambitious cooking days include a homemade Thai meal or two. Thai meals usually include a lot of prep and planning, so I typically avoid them unless I’m feeling ambitious. That is, until I discovered Shrimp Satay Skewers. 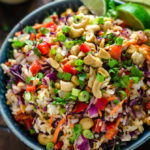 These are a breeze to put together if you have any typical Asian ingredients in your house (because most of the magic is through marinating), and they taste so, so, so good that you’ll hardly be able to wait to turn them into impressive appetizers for your friends and family. 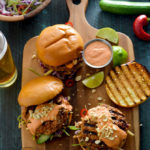 Don’t be intimidated by the ingredients list– anything you don’t already have laying around should be easy to find and relatively inexpensive in the International aisle of your supermarket. 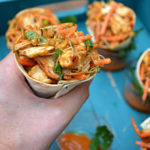 You can make the Shrimp Satay Skewers for dinner with the Thai Spicy Peanut Sauce on the side, but when you put it all together in little plastic disposable cups with simple shredded carrot and cilantro garnishes and you’ve got a beautiful hors d’ouvre on your hands! 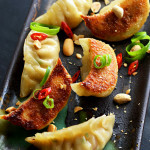 Everyone will be fighting over these tasty Thai treats, so make sure you make enough! 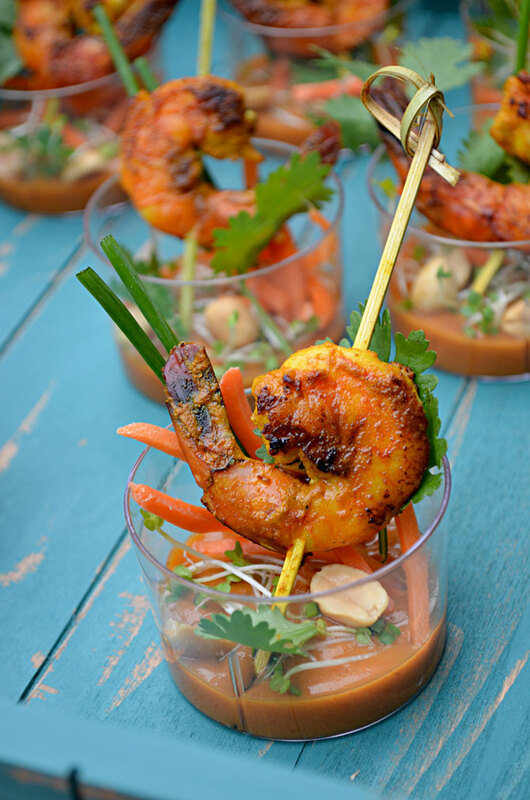 These Thai Shrimp Skewer Shooters are so delicious and impressive that you won’t believe you can make them yourself! They’re perfect for parties, or just ditch the plastic cup and eat them for dinner. In a large bowl, combine all ingredients except for the shrimp and mix well. Stir the shrimp in, cover, and marinate overnight in the refrigerator. Grill, sauté, or bake the shrimp (you can go free-style or thread the shrimp on bamboo skewers) until pink and cooked through. Heat the coconut cream in a medium sized, heavy-bottomed pot over medium heat. Add the red curry and sauté for 1 minute. Add the remaining ingredients and simmer until thickened, about 3 minutes. Take the pot off the heat, let the sauce cool down to room temperature (or slightly warmer), and serve the sauce with satay. 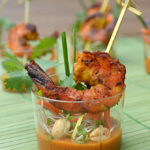 Add a spoonful or two of the Thai Spicy Peanut Sauce to the bottom of a disposable plastic cup for dipping. Sprinkle and arrange the garnish ingredients. 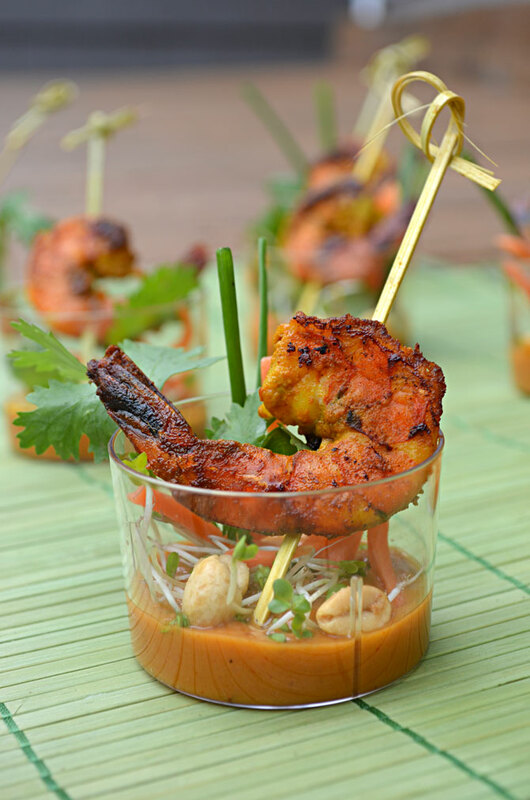 Place the Shrimp Skewer in the cup and serve. I made this this past weekend for the football game. A complete and total hit. Nothing left and rave reviews (even from someone that “claims” to hate Asian food). Thanks so much for the recipe. I’m so glad to hear, Heather! Thanks for letting me know! Morgan – wherever did you get those cute cups? I’ve been looking everywhere for some that are attractive. Gonna try this recipe this weekend. Hi Irene, I got them from Party City, I believe! They’re plastic and disposable, but they do the job! Morgan, can you tell me how many canapés this recipe makes and is the recipe easily doubled? How essential is marinating it overnight? Is there a minimum marinating time?